The holiday season has become saturated with stuff. Shiny, new, novel stuff. Increasingly so, the spirit of giving gets lost in a consumption–driven, sale seeking madness, fuelled by cheap chocolate and festive flavoured hot drinks. We forget that a huge part of Christmas is generosity. This Because, an ethical marketplace set up by the incredibly talented Zoë Quirk, has hit the nail on the head, so to speak, with holiday hampers designed to be generous in nature. The hampers fall in line with the festive convention of giving consumables but are a carefully curated selection of products that are made resourcefully and support great causes. 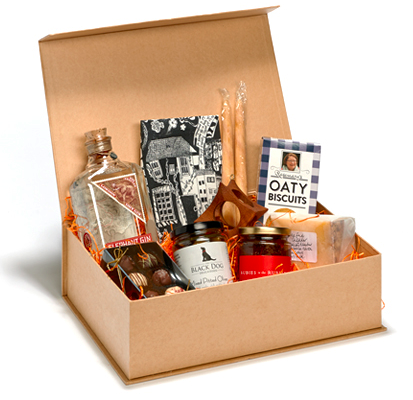 From cheese produced in a dairy that creates opportunities for people with mental health issues and chutney made from surplus food, to oat cakes that support ex-servicemen, each item in addition to being high quality, goes further by supporting small thoughtful businesses and social enterprises. To wrap it all up, the hampers are packaged in a beautiful box complete with bells and a magazine that introduces all of the products. My mum absolutely loved hers (and even asked if next time I’m in the UK I can bring her back more of the cheese). Whilst the hampers are a one-off for the holiday season, keep an eye on This Because. No doubt, they’ll be doing some great stuff in 2015.